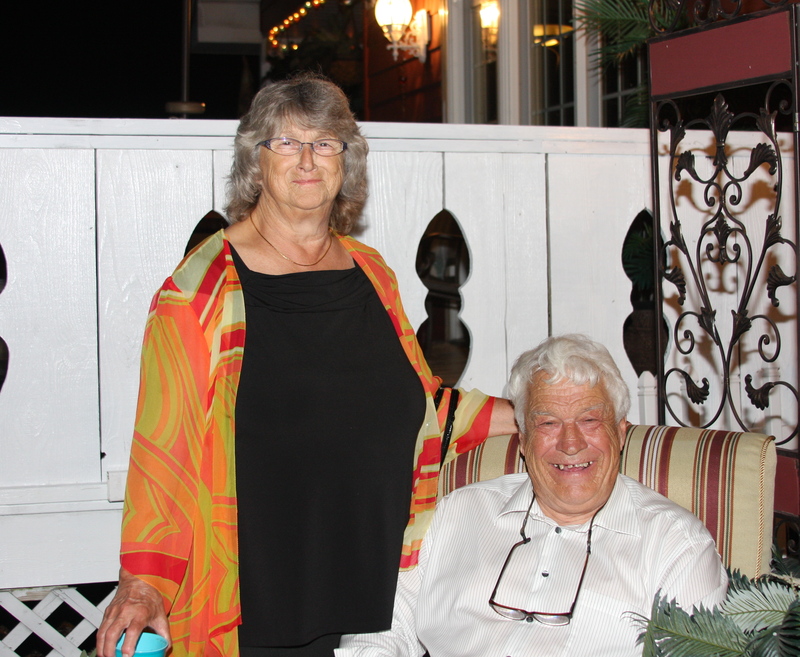 Barney and Janet Sutherland are two of the most loving and giving people I have ever met. They have both dedicated their lives to the students at Reeths-Puffer High School. Their love for all of us at R-P has been unconditional. Sadly, both Barney and Janet lost their spouses at a very young age while they both were teachers at Reeths-Puffer. After some time had passed they started dating and eventually were married. Together these two pledged their love to each other and to the students of Reeths-Puffer. They are both retired from teaching now but are still involved with many activities at the school. They try to attend every graduation party, wedding and class reunion that they are invited to. During my 35th class reunion they made a special effort to stop after they attended a wedding. 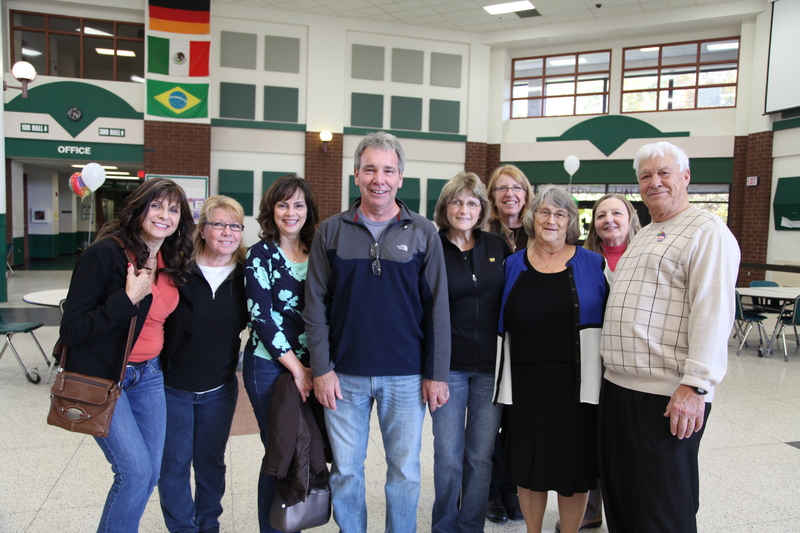 Barney turned 80 this year and his family hosted a birthday party in his honor at the high school. Students young and old attended because they wanted to say thank you to a man so dedicated to us. 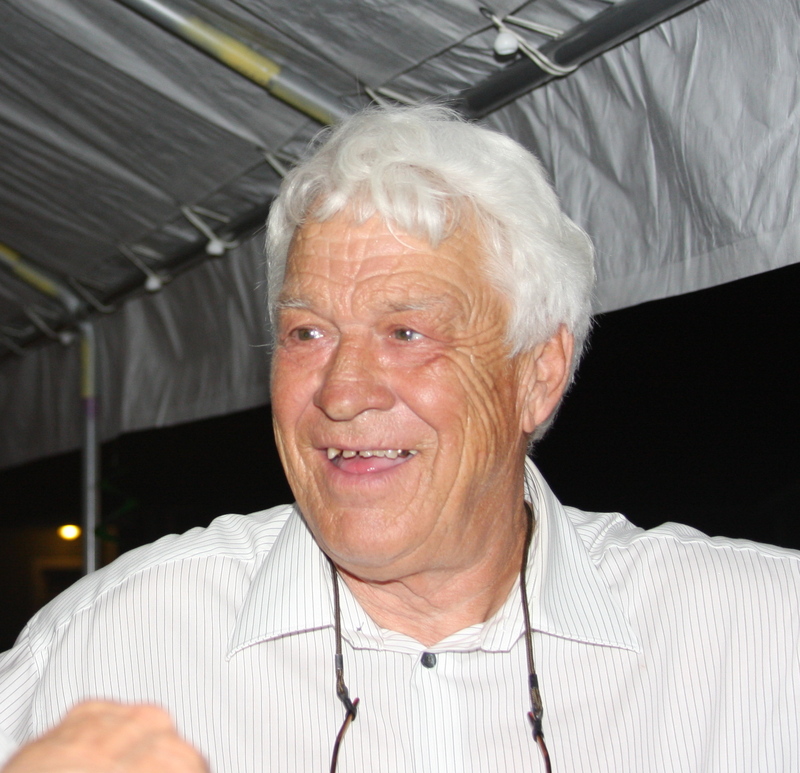 Barney may be 80 but he still remembers most of his students names and the year they graduated, which amazes me. While at Barney’s 80th birthday party we heard many wonderful stories. Our friend Margo Burdick Brown, a 1973 graduate, traveled over three hours to attend Barney’s party and so did many others. Another friend Kay Somerville Bradley, a 1976 graduate, told us a beautiful Barney story. Many years after Kay graduated from high school and was newly divorced, she was wondering how she was going to support herself and her kids. She went to Reeths-Puffer to find Barney because she needed some guidance. Barney happened to be on his break in the teachers lounge. When Kay saw Barney, she immediately burst into tears. He calmed her down and talked with her and helped her formulate a plan for her future. He hired her on the spot to clean his house and found some friends to hire Kay, too. Kay is still very grateful for his love and guidance. Janet was my dedicated cheerleading coach and made sure we went to cheerleading camp every summer. What I didn’t appreciate back in the early 70s was Janet was a young widow raising kids on her own and was probably in mourning from the death of her husband but she kept living and focused her efforts on helping others. 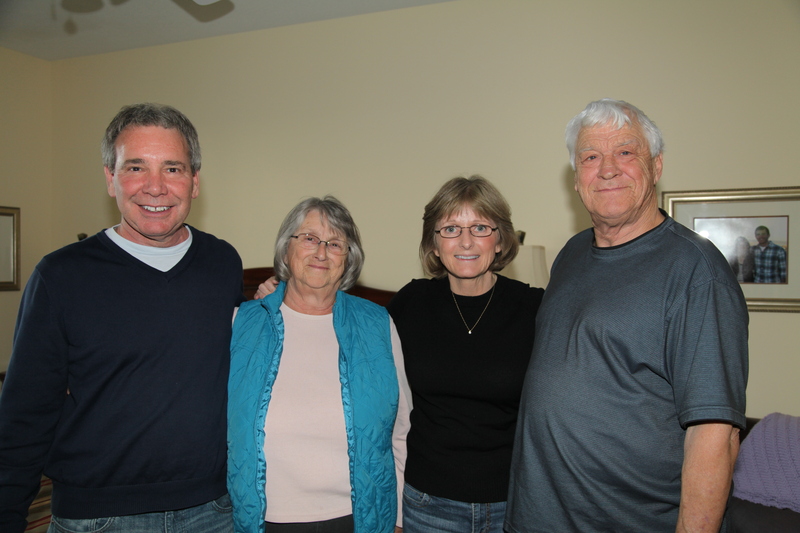 Barney and Janet’s ministry didn’t stop when they left school because they lovingly welcomed my friend and classmate Darrell White into their home to live with them. They probably welcomed others too. I feel like Barney and Janet mimic the life Mother Teresa lead but instead of ministering to the poor they ministered to the lives of so many of us at Reeths-Puffer. We love you and we will never forget the gifts you have given us. Wonderful tribute to a great couple from an amazing woman! There will never be another couple like the Sutherland’s! I cannot comprehend how they remember so many students and place them in their timeline. Every time I see mr. S, he always addresses me as peanut. I was swearing off meat back then. But he still remembers! I also was an aide to mrs. S in computer class. She also remembers that! Many years and many memories! Mr. S had me do a collage of planets before the old stadium was demolished. We gave the old stadium a well deserved farewell. A chunk of it still rests in my memory box. As many more memories that will be remembered too! I have never had the privilege of working as closely as many of you with the Sutherlands. But they are truly the face of the community. And when I think of them. All I see is R-P!!! Love this couple, they go beyond just being teachers, they are friends! They come to our class of 1968 breakfast quite often, they bring their smiles and spread their love, and inspire us still! They both took time out of their busy lives to attend our class reunion this past summer, made us feel important and that we mattered to them! We were honored to have them be with us! As I type this, I remember Janet, being the one that taught me my typing skills, she was such a great teacher, she was patient and very dedicated, I can honestly say in the years I had her as a teacher, she never spoke harshly to any of the classes I had with her! Barney had a heart of gold, still does, but I remember when his heart was doing flip flops over this beautiful lady, Janet! We were bound to secrecy but we knew, they were going to end up as Mr. and Mrs. it was our class, that we saw them making google eyes at each other. We kept their secret, even from them, they didn’t know we knew, but how could we miss those looks, they gave each other! Barney and Janet have made a big difference in all of us who attended Reehts-Puffer during their teaching years, they have left a great influence on each and everyone of us, they taught! We love you Janet and Barney, thank you both for all your dedication, you will always be more than teachers to us, you are our friends also! What a wonderful well written tribute for two of the most beautiful people to ever walk the halls at RP. I was blessed to cheer under Janet’s direction and was taught by Barney. They instilled the Rocket Pride in me and I am a better person because of them. They even made a surprise appearance to our 25th reunion in my backyard…after thinking they were lost. Had many good laughs with each of them. Much love to Barney and Janet…they just don’t come any better then these two! Class of 1983. Barney was such a inspiration to me playing softball. He always had time and taught me a lot. Awesome story what a incredible couple, brought back a lot of memories. I was blessed with knowing only Mr. Sutherland. He is an amazing man! He has truly touched the lives of many teenagers. I remember how quick witted he was and all the useless trivia he would spout off in class. I looked forward to his class and seeing his smile everyday. He is a genuine guy who cares about people. I can truly say he has made an impact on my life. I was blessed to have them both when I was in school… By the time I had them .. They already had my sisters and brother… They are most respected as a couple and as individual they have touched many lives that have made a difference and I am honored to have been a part. Mr. Sutherland tolerated me as a runner on his cross-country team, and inspired me with his Fiat (and that Jaguar in the garage) to buy a MG Midget as my first car. One spring when the snow began to melt, I went for a Sunday run and somehow, 17 miles later, arrived at his front door up in Whitehall. He had the immense kindness to pour me into his car and drive me home! Mrs. Sutherland taught me touch typing, a skill that has proven so indispensable that I could not post this message (or earn a living) without it. Fond memories of very special people. An awesome tribute to a very deserving couple. They are truly Mr. And Mrs. Reeths Puffer. To Rosemary and Mark: You are both very special people–you were special in high school and evidently have been special as parents and adults! Thank you for the beautiful tribute and for continuing to be the giving, loving, Christian people you are. What a dedicated couple…I know Erika thought he was the smartest man she knew! Oh, that’s so sweet. Great people. Really nice story about Kay. I know Barney always compared me to my older sister, Ruth from the class of ’68. They were a wild bunch from one of his first years teaching.